This year marks the 30th anniversary of one of the most successful men’s fragrances of the 70’s — Geoffrey Beene’s violet-tinged Grey Flannel. Released two years after my birth, Grey Flannel is an aroma that has been part of my development, always present throughout my life as a holiday gift from relatives, sitting on friend’s dressers, or displayed as testers on drugstore perfume counters. It is only now that I am also in my 30s that I have begun to appreciate what an unusual scent Grey Flannel is. With a simple composition of violet, lemon, orange, oakmoss, sage, and sandalwood (and perhaps also cinnamon, geranium, cedar and patchouli), Grey Flannel could easily be mistaken as a Diptyque creation. Though the fragrance is not entirely a floral, the unusual violet note is the undisputed star of the olfactory pyramid. When paired with citrus, oakmoss and sandalwood, gone are the candy-sweet connotations of violets, and “hello” warm, comfy pajamas. The citrus brightens the composition while the oakmoss and patchouli ground and tame it. The sandalwood, hardly noticeable, surely helps anchor the scent as it seems to have two different characters, soft and fresh, and warm and shadowy. The fragrance opens with all the players present and accounted for, and so simple is the composition that the notes are nearly seamlessly blended. Though neither development nor complexity are present, the sillage is effective and the longevity impressive. Overall there is something about Grey Flannel that reminds me of the bare bones structure of Dior Fahrenheit, and in the drydown, a simpler Eucris. This is a scent from before the era of ozonic marines, before men’s gourmands, before the exploration of new synthetic notes. Though I doubt Grey Flannel will ever be a staple in my collection, I’m thrilled to have had a chance to take a deeper look, or rather, sniff at why this scent has lasted 30 years. With simple packaging, a simple composition, and a simple price tag to boot, now’s a great time to re-visit this classic, or if you haven’t already, to try it for the first time. 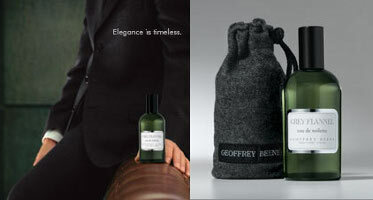 Geoffrey Beene Grey Flannel may be purchased at most major retailers, and if you shop carefully, the 120 ml bottle of Eau de Toilette can be had for under $25. And another note: Marlen is travelling this week and may not be able to respond to comments. Oh, this fragrance brings back bittersweet memorie, Marlen. You see, my best friend in grad school wore Grey Flannel. He died of AIDS in 1985, one of the early casualties. Though the years have washed over me with career, marriage, babies and life, I still miss him terribly. Thank you for reminding me how special he was. Love Grey Flannel, my favorite men's cologne of all time. If you remember me… I told you once on the basenotes forum that my mom always wore Miss Dior, well my dad used to travel a lot when we were children and so we got unusual gifts for a, say, 10 year old… my brother got Grey Flannel and I got something more simple like Sagamore or Pierre Cardin (I think it was it, the cologne) we didn't get to pick wich one was for each brother (or sister, my 5 y.o. sister begun receiving parfums a couple of years later). Summing up: I thought that it was unfair that my younger brother got that wonderful fragrance and i got plain old Pierre Cardin!!! (damn I was a drama queen back then , awful! ) The fragrance has great sillage and the violets are genius, but the “similarity” with farenheit at the drydown is what has kept me from using it. This saturday I turn 33, but it still smells to me as a sort of “old man” fragrance. Classy, yes, but not for me. If confronted with a board-room respect-inducing situation, I would go for Guerlain's Heritage. Happy Birthday, Geoffrey Beene's Grey Flannel, may future fragrances be half as classy at the same price point as you are!!!! Grey Flannel is my favorite men's fragrance of all time, too! To me it just smells clean, like soap.